Whether you are just starting out and in your first job, or you are approaching retirement, or somewhere in between, you need to pay close attention to your personal finances. 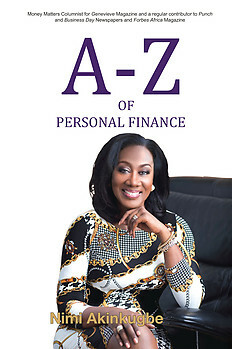 In A-Z of Personal Finance the author, with a professional career spanning over two decades in banking and private wealth management, provides you with important practical information and useful tips on matters concerning you and your money. "This is a wonderful, easy to read book on personal finance that can be applied by the average person to help them come to grips with their financial realities in order to achieve financial security. In this book, Nimi has shared many useful tips and practical strategies in a step-by-step guide without leaving the reader overwhelmed. She offers frank, practical insights and advice to create a greater awareness and understanding of personal finance and wealth management issues. Nimi's A-Z of Personal Finance underscores the importance of financial literacy and inclusion, an area in which the Securities and Exchange Commission (SEC) is very committed. The objective of the Financial Literacy Framework is to implement programs and provide tools that educate the Nigerian populace and increase their understanding and participation in the financial markets so that they are aware of the risks and can benefit from the opportunities." "Nimi Akinkugbe has a nice writing style, and a very solid grasp of personal finance issues. I'm sure her book will be very helpful - to both Nigerians and Americans." "In the many years I have known Nimi, one thing that stands out about her and brings a glimpse of light to her eyes is her passion and commitment to making women and children financially literate. Parents, children and young adults will be better financial managers after reading this book." "Writing about personal finance in a way that is engaging and easy to understand is a rare skill. Opunimi Akinkugbe has that gift and combines it with a 'knowingness' that enables her to interpret its concepts in an idiom that breaks through many taboos and cultural prejudices and just simply makes sense. This A to Z will cut to the chase and simplify the achievable financial goals for you and the future of those who matter to you. What can be more personal or more important?" "The content and quality of this clearly thought out book make it essential reading for those individuals who seek to plan and take control of their financial future." Nimi Akinkugbe is Founder and Chief Executive Officer of Bestman Games Ltd. In December 2012 her company launched the City of Lagos Edition of Monopoly, the first African city edition of Hasbro's world famous board game. Prior to this, she enjoyed a successful banking career spanning 23 years during which she served as General Manager and Head, Private Banking at Stanbic IBTC Plc and subsequently as Regional Director (West Africa) for the Wealth & Investment Management Division of Barclays Bank. She regularly contributes articles that are featured in a host of prominent publications including Genevieve Magazine, The Punch Newspapers, Business Day, and Forbes Africa. She is a much sought after speaker and guest on television and radio programs. Through these fora she has been able to create greater public awareness and understanding of personal finance and wealth management issues.